After spending fifth and sixth grade in and out of the hospital while ill with cancer, Norah finally gets to start middle school. It's awkward-- all of her friends are familiar with how everything works, and Norah just feels like she is The Girl Who Had Cancer and that no one really knows how to talk to her. That's why it's a little bit of a relief to be put into 8th grade science and math, since her tutor pushed her further than she would have gotten in school. When she meets Griffin, a new 8th grader, they bond over their love of drawing and mythology. The only problem is that Griffin doesn't know she's in 7th grade, and she doesn't want to tell him that she isn't able to attend after school clubs because her parents are limiting her activities while her immune system is still compromised. This leads to some bad decisions on Norah's part-- she skips health class and stays after school to talk to Griffin, and her divorced parents aren't happy. Her mother eventually has to go home to California, where she is a college professor, and it's tough for Norah to have her go away. A variety of run-of-the-mill middle school things happen to Norah, but they hit her harder since she is still in "re entry mode". She has a lot of people supporting her, but she still just needs To figure out how to make her own way in middle school. Strengths: While Norah is dealing with the unusual circumstance of having had cancer, most of the problematic situations that bedevil her are completely usual to middle school. Her parents are overprotective. Her friends have grown away from her. She likes a boy. She feels misunderstood, and she occasionally does embarrassing things. These are the sort of realistic problems my students ask for. Bonus points for supportive parents who are still alive, and for making Norah a well rounded character with her own particular interests. I enjoyed this one a lot. Weaknesses: I know what the cover is trying to accomplish (to look like the adult coloring books that are so popular now), but I'm not sure it works. I'll be curious to see a print copy. The only other thing I would change would be to exclude the student mythology presentations. Somehow didn't work for me. 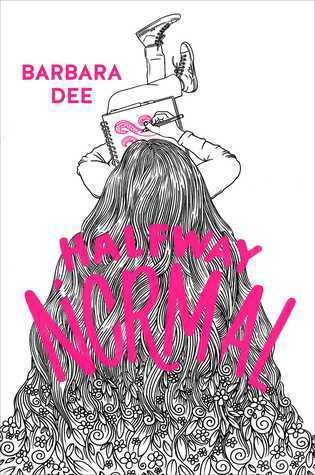 What I really think: While Ms. Dee certainly brings a deeper level of understanding to Norah's character (and her parents) because her own son had cancer, she does such a well researched, modern problem novel that this would have been excellent anyway. A must purchase for middle school libraries, especially since there aren't a whole lot of books (with the notable exception of Sonnenblick's 2010 After Ever After) about students living with the after effects of cancer.